Congratulations to the Patriots, I guess. I suspect most people watching the game, especially outside of New England, were rooting for the Rams and I was as well. However, I was not particularly vested in the outcome. As much of a Packers fan as I am and as much as I admire Vince Lombardi, grudgingly I must acknowledge that Bill Belichick is the greatest coach in NFL history. Nine Super Bowl appearances (and six wins) in 18 seasons is just amazing. I had the good fortune to attend one Super Bowl in person. As Director of Baseball Operations for the team whose stadium in which the Super Bowl was played one season I had the opportunity to watch the game from a “privileged” venue. Unlike yesterday’s game I was very much vested in the outcome because it pitted one of my two favorite teams against one of my least favorite teams at that time. Nervously pacing in the box for the entire game I finally said out loud and to no one in particular, “How do NFL head coaches do this every week?” The President and CEO of the baseball team for which I worked answered, “Because they don’t care as much as you do.” That remark caused many people in the box to erupt in laughter. Even I had to laugh. From carswithmuscles.com a picture of a 1967 Pontiac GTO. As regular readers know my first car was a ’67 Goat. As they should also know I am not exactly blessed with good dreams. Last night I dreamt that I had found and restored my first car. However, something went amiss and I was unable to open either door. In disgust I left the garage. Some time later I returned and noticing a small reddish-brown stain on the driver side front window I decided to see if the door would open. To my amazement, it did and so did the passenger side door. I was also able to remove the stain with my thumbnail. That type of happy twist is rare in my dreams. I try to learn something new every day. To me, learning is entertainment and most of what passes for entertainment these days is not remotely entertaining to me. My wonderful wife and I were out looking at cars yesterday—a not infrequent pastime of ours—and decided to drive to the nearest CarMax to see if we could find anything interesting on the lot. To our surprise it was open on a Sunday. In fact, it’s open every Sunday. I have been told on more than one occasion that in the state in which I live it is illegal to actually buy a car on Sunday, which is why the car dealers here are closed. I asked a salesman how CarMax was open every Sunday given what I thought to be true about a Sunday prohibition and he informed me that wasn’t the case. He said other dealers are closed on Sunday just to give their employees a day off. He did elaborate that in some counties in a neighboring state car dealers were basically forbidden to be open on Sunday. Well, I did it…a paragraph with seven Sundays: a week of Sundays. You still might have nightmares. I have written this line from the movie Diner in a few posts, “If you don’t have dreams you have nightmares.” Last night I had a dream that I was going to pick up my completed restomod C2 Corvette. (I told you I was obsessed.) However, when I arrived at the address I was given no one was there. The building was enormous and I had no idea how to find my car or how to get out of the building. So I dreamt that my bucket list car was complete, but I couldn’t find it or find anyone who could tell me what was going on. What can I say? I think, however, that means my Z4 is not long for my garage if I am already dreaming about its replacement, no matter how unhappy the dream. 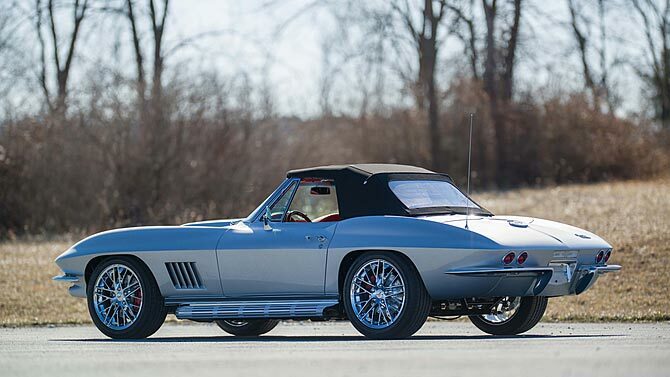 From corvetteblogger.com a picture of a 1967 Corvette restomod. It is the same picture I showed here. I have an afternoon of cardiac testing today. As noted in this post, I recently spent a morning in the ER because my heart was generating an abnormal frequency of PVCs, Premature Ventricular Contractions. I have had PVCs my entire life probably because I have Mitral Valve Prolapse. Many of these 1.2 million deaths are preventable. I am going to rant…if you are 100 pounds overweight you didn’t get that way overnight. Americans want a magic pill, a magic diet or a magic surgery. Magic isn’t real; it’s an illusion. You didn’t gain the weight overnight; you can’t really lose the weight overnight. The CDC estimates that 71% of American adults are overweight. Not coincidentally, most studies put the percentage of American adults who don’t exercise regularly at about 70%. Don’t take your health for granted and don’t count on “magic” to make you better. Besides, if Americans get fit maybe they’ll stop buying so many SUVs and pickup trucks and buy some exciting cars, instead.